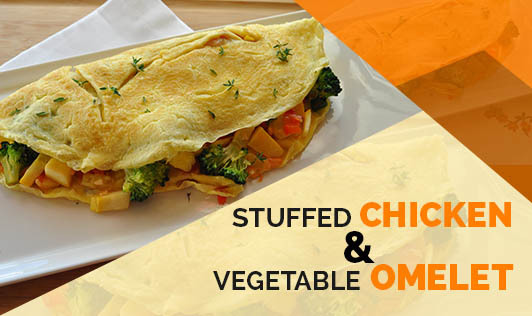 Turn your plain egg omelet into a more nutritious and colorful dish by stuffing it with some fresh veggies and shredded chicken. Add in greens like spinach & amaranth along with cheese and sneak in vital nutrients into your kid's diet. Finely-Chopped French Beans- 2 nos. • Heat 2 tsp of oil in a nonstick pan; add the shallots and sauté on medium heat for 2 to 3 minutes. Add the rest of the vegetables, chicken, and spinach, and sauté for 5 minutes. Season it with salt and chili powder, turn off the heat, and keep aside. • Break 2 eggs into a bowl, add 1 tbsp of milk, salt, and pepper to taste and whisk it all together until frothy. • Heat ½ tbsp of oil in a nonstick pan; add the egg mixture and spread to make a round omelet. Cook for a minute and turn over. Cook for a few seconds and flip again. • Now add the sautéed vegetables on one half of the omelet, sprinkle some cheese on it, and use the other half to cover it. Cook for a few seconds. • Remove the omelet and serve hot along with tomato ketchup or toasted bread.